I still feel like there just aren't enough hours in the day to accomplish all i need to - thank goodness i am a list maker (lots of lists tucked everywhere but i do try to keep a master)! So this past Thursday was my birthday - and it was a big ZERO birthday that I've sort of been dreading. It turned out to be an amazing day, hopefully the start of an amazing year! I'll post more about the fabulous Birthday celebration in a few days but for now i wanted to post a few of my latest My Little Shoebox creations using the Heartfelt line! I love this line - vintage and warm! This first photo is Amalia - she's 9 mos old and her parents Josh and Sarah are my cousins. 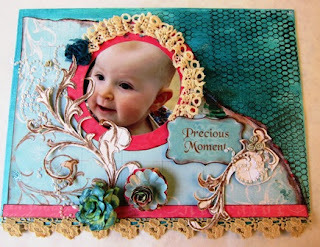 The project is a canvas, with the Heartfelt paper as well as some paints, glimmer mist, stamping, etc. The 2nd is a layout,, of my recent visit to see my Uncle.